Cancer research, using mouse models to investigate molecular mechanisms in acute myeloid leukemia and myelodysplastic syndrome, with focus on the function of the zinc finger oncoprotein EVI1. Dr. Perkins is an active participant in the clinical hematopathology service as well as a researcher exploring the genes that impact the development of leukemias and other human malignancies. His primary focus is acute myeloid leukemia (AML), a particularly lethal type of cancer with no effective therapies at present. His clinical responsibilities include interpretation of bone marrow biopsies and smears, lymph node biopsies, and spleen; and laboratory analyses of coagulation disorders and hemoglobinopathies. Dr. Perkins is an active participant in the clinical hematopathology service as well as a researcher exploring the genes that impact the development of leukemias and other human malignancies. His primary focus is acute myeloid leukemia (AML), a particularly lethal type of cancer with no effective therapies at present. Dr. Perkins' current research focus is on Evi1, a complex locus that plays a critical role in both normal Hematopoiesis and myeloid leukemogenesis. Evidence indicates that Evi1 is an important player in maintenance of the leukemic stem cell compartment by increasing proliferation and prolonging survival, in part through regulation of the transcription factor Gata2 and the anti-apoptotic molecule Bc12a1. 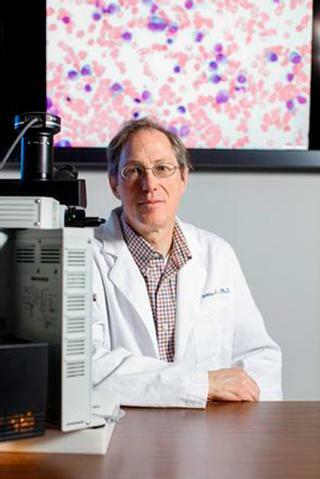 His current work encompasses embryogenesis in genetically modified mice, identification of chromosomal Evi1 binding targets, Evi1 protein-protein interactions, clinical implications of chromosomal rearrangements involving Evi1, and exploration of potential therapeutic approaches to block the function of Evi1 in leukemia. Crane GM, Perkins AS. "Leukemic presentation of diffuse large B-cell lymphoma: an unusual pattern associated with splenic involvement." Blood.. 2017 Nov 16; 130(20):2233. Mateo F, Arenas EJ, Aguilar H, Serra-Musach J, de Garibay GR, Boni J, Maicas M, Du S, Iorio F, Herranz-Ors C, Islam A, Prado X, Llorente A, Petit A, Vidal A, Català I, Soler T, Venturas G, Rojo-Sebastian A, Serra H, Cuadras D, Blanco I, Lozano J, Canals F, Sieuwerts AM, de Weerd V, Look MP, Puertas S, García N, Perkins AS, Bonifaci N, Skowron M, Gómez-Baldó L, Hernández V, Martínez-Aranda A, Martínez-Iniesta M, Serrat X, Cerón J, Brunet J, Barretina MP, Gil M, Falo C, Fernández A, Morilla I, Pernas S, Plà MJ, Andreu X, Seguí MA, Ballester R, Castellà E, Nellist M, Morales S, Valls J, Velasco A, Matias-Guiu X, Figueras A, Sánchez-Mut JV, Sánchez-Céspedes M, Cordero A, Gómez-Miragaya J, Palomero L, Gómez A, Gajewski TF, Cohen EE, Jesiotr M, Bodnar L, Quintela-Fandino M, López-Bigas N, Valdés-Mas R, Puente XS, Viñals F, Casanovas O, Graupera M, Hernández-Losa J, Ramón Y Cajal S, García-Alonso L, Saez-Rodriguez J, Esteller M, Sierra A, Martín-Martín N, Matheu A, Carracedo A, González-Suárez E, Nanjundan M, Cortés J, Lázaro C, Odero MD, Martens JW, Moreno-Bueno G, Barcellos-Hoff MH, Villanueva A, Gomis RR, Pujana MA. "Stem cell-like transcriptional reprogramming mediates metastatic resistance to mTOR inhibition." Oncogene.. 2017 May 11; 36(19):2737-2749. Epub 2016 Dec 19. Wilson M, Tsakraklides V, Tran M, Xiao YY, Zhang Y, Perkins AS. "EVI1 Interferes with Myeloid Maturation via Transcriptional Repression of Cebpa, via Binding to Two Far Downstream Regulatory Elements." The Journal of biological chemistry.. 2016 Jun 24; 291(26):13591-607. Epub 2016 Apr 21.